*This Level 3 Course can be supplemented by hours of teaching in your own country, making it a Level 5. You would simply need to provide us with references or your current supervisor’s contact details, for us to confirm and validate your hours of teaching. 3 mentoring sessions to discuss your lesson plans and reflective so as to anticipate your future teaching practice. This is to ensure that you have complete understanding of the tenets of TEFL in practice. The 3 x 15-minute Skype mentoring sessions with your TEFL Trainer mentor, to complete within 6 months from starting the course. 6 online exams to complete, as part of the summative and final evaluation of our Online TEFL Course, within 6 months from starting the course. 6 lesson plans to submit to TEFL Trainer within 6 months from starting the course. 6 reflective diaries to submit to TEFL Trainer within 6 months from starting the course. A hard copy of your Certificate upon completion of the programme and reception of the 6 reflective diaries, 6 lesson plans, and completion of the 6 final exams. All learning blocks must be completed within 6 months from signing up, in order for you to receive your TEFL Certificate. We will also send you an email with the breakdown of your grade. 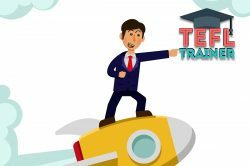 A/ COURSE AIM: Why choose to do this online TEFL course? 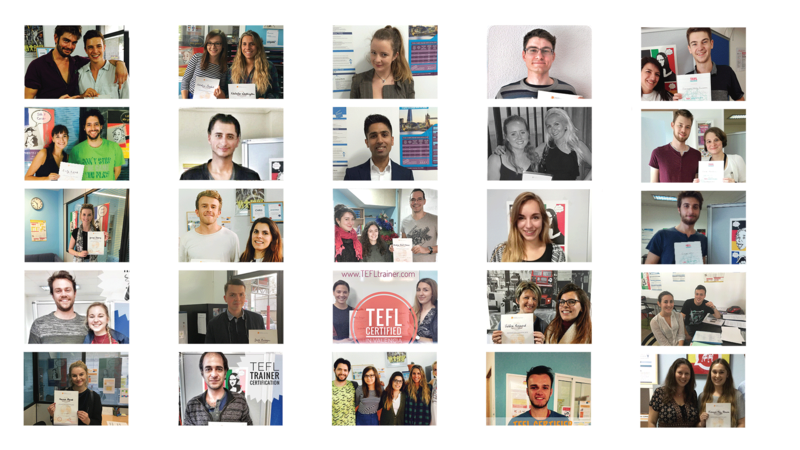 The overall aim of TEFL TRAINER’s accredited online TEFL Course is to make you very knowledgeable in all course types and levels, ensure that you have a high level of language awareness (phonetics and grammar: getting up to speed with these language systems is key), and that you know how to deliver a structured, enjoyable, and effective class. This sound introduction to the world of teaching is paramount for a successful career in TEFL. B/ ELIGIBILITY: Who can do this online TEFL course? We offer our TEFL Certification Course to students and graduates alike, no limit of age. No prior qualification or experience in teaching is required. High level of English (native or B2+ non-native levels are welcome), determination, and willingness to learn are the requirements. Regardless of the online TEFL Course you select, we recommend a phone call to run through the Student Handbook you receive upon signing up. We are always available by email to provide support and guidance. C/ ONLINE TEFL COURSE SYLLABUS: What will you learn? A/ Basics of Teaching: an introduction to TEFL. B/ Phonetics: a comprehensive unit to understand the IPA and start using it to teach phonology and pronunciation. C/ Grammar: a thorough review of word classes, functions, and more. Example below! D/ TEFL language and levels units, to start planning your lessons. I/ 6 final exams (on Chapters A, B, C, D, E, and F). Lesson Plans: 40% of final grade. You must obtain a minimum of 60% in each of the 3 learning blocks of the Online TEFL Course. Our three learning blocks enable us to mark you fairly, using your reflective diaries (30% of your final grade), your online exams (30% of your grade), and your lesson plans (40% of your grade). So regardless of your learning style you will be able to obtain a high score through hard work. Our Online TEFL Course contains some of the following media and content types. Plenty of theory is explained in our videos! Over 100 are available and include Grammar, Phonetics, and Spelling. Learning the theory of TEFL is important. Get ready for your teaching practice through case studies and the study of real classroom scenarios. Short, digestible, and useful content! Practice makes perfect: our formative quizzes can be completed many times. The summative final evaluations can only be completed once. F/ MORE ABOUT THE ONLINE TEFL COURSE: How to complete this course? First of all the Online part of our TEFL Course comprises a complete Grammar Course, Methodology Units, Language and Levels Units, and Classroom Management Units. The study programme focuses on the most essential TEFL skills and is considered a complete and advanced course. This online TEFL course lasts 140 hours when spending 40 to 60 minutes on each grammar point and an average of 60 minutes on each of the other chapters contained in the other units (Language and Levels, Methodology, and Classroom Management). We would not recommend completing this course in less time! In short, our professional video tutorials, explaining TEFL essentials point by point, using plain English and lingo, enable you to gradually acquire the “metalanguage” (lingo of Grammar) and other jargon, as well as good subject knowledge. You will learn everything you need to know to Teach English Grammar (Teaching English as a Foreign Language – TEFL). The videos are supplemented by interactive exercises and text you can read online. So this is a great online TEFL course for learners of English and for future TEFL professionals (teachers and coordinators) as it comes with units on Methodology and Lesson Planning (ideal for self-study and teaching). You will learn about a system of methods you can use or mistakes to avoid in the classroom. Language and Level units are designed to give you a better understanding of the CEFR (Common European Framework of Reference for Language Learning, Teaching, and Assessment) and help you identify and address common mistakes made by learners of English. The Classroom Management units will give you some insight into disciplinary problems, motivation and organisation in the classroom. This course can take between anything between 50 and 140 hours, depending on your prior knowledge of English, on whether you have taught before or not, as well as your level of perfectionism. 1 Skype session to run through the Student Handbook and receive general guidance for the course. Complete the online course at your own pace (122 mini chapters with quizzes and 6 final exams when you are ready) – generally completed over a 1 to 6-month period > any support or extra guidance would be provided by email. 1 Skype session to discuss your 12 topics (lesson plans and reflective diaries). Draft your 6 reflective diaries and 6 lesson plans. 1 Skype session to go over run through all your assignments and your CV whilst discussing how to apply for a job in TEFL. Last but not least, we are a fully accredited and recognised TEFL certification provider: more information here. Our extremely comprehensive course will enable you to gain the knowledge and confidence to correct and praise your students, guide them, and deliver classes which will be varied and relatable.